Summer is for slowing down and savoring the sunshine, sunsets, and sunglasses life, right? Then why do we so often end up hustling from ball games to picnics to work meetings to doctor appointments to road trips to endless Target runs, wearing ourselves thin and not pausing to enjoy any of it? A big part of the reason why we fill our summer schedules to overflowing is because we fear missing out on good things (we experience FOMO, as the cool kids call it). Because we're so afraid of missing out on things, we pack our days, weeks, months, and years with everything we can possibly fit in, and then some. But can I tell you a little secret? Actually, it's two. You can't actually do it all. You're not missing out when you're doing what's most important to you. None of us are able to do everything. It might look like your neighbor, coworker, or cousin can do it all based on their social media feeds, but I assure you that if you took a peek inside their home on a regular Tuesday afternoon, you'd find a different story: dirty dishes piled up in the sink, laundry everywhere, toys scattered across the floor, a mystery substance on the kitchen table, and muddy footprints by the back door. Nobody can juggle everything our culture seems to suggest we can, and when we try to do it all, we just run ourselves ragged and let the chaos drain the joy out of our lives. I don't know about you, but that's not how I want to live my life (actually, I strongly suspect you feel the same way, or you wouldn't be here, reading this right now). I would far rather have a life full of my favorite things and people and some messiness than to have one that looks picture perfect on the outside but feels ever so ragged and out of order on the inside. Summer is the best time of year to slow down, hands down. The days are longer. The kids aren't in school (I don't have any, but you know, friends' kids and cousins' kids and the kids down the street...). It's vacation time and pool time and time for lake days. It's the season of trips and travels. It's the time for more days spent with loved ones. And we can't do that if we're running ourselves into the ground trying to tackle mile-long to-do lists. So let's choose to slow down in this season so we can spend more of our time and energy the way we want to-- lavishing in these longer, sunnier days with our people. 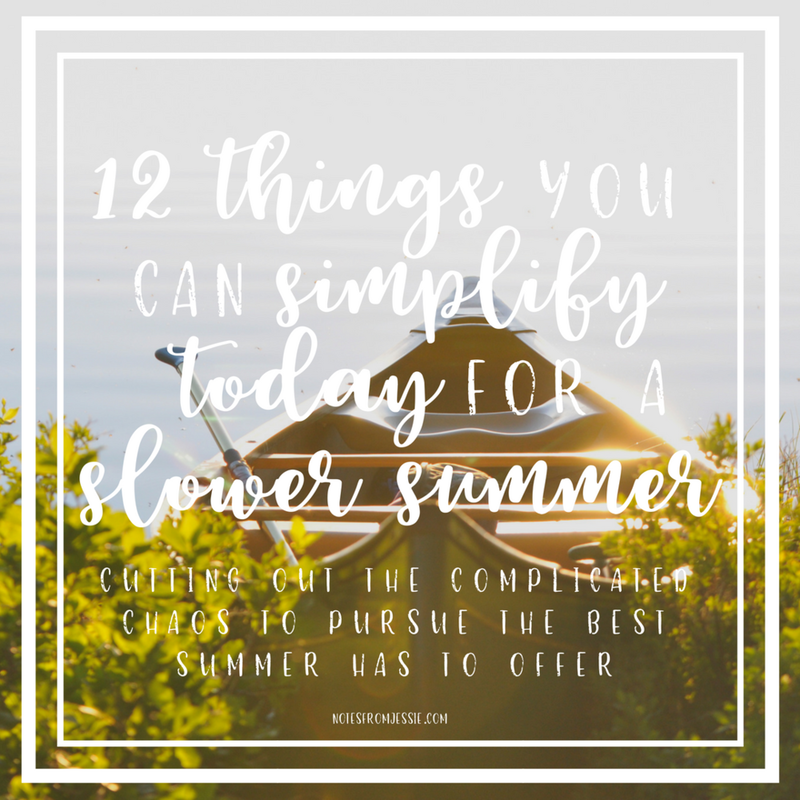 Because I don't want to just offer empty encouragement to live slower, I'm also going to give you some practical, real-life tips to make it happen this summer! Make sure you grab the printable version of the list here! Write down all your goals for your summer. What do you want to do? What do you want to accomplish? How do you want to spend your time? Now look at your list. How does it make you feel? Chances are you came up with a pretty long list. Most people do. Once we start thinking about all the possibilities and everything we'd ideally like to accomplish, we go crazy, thinking we can fit in more than is actually possible. Highlight the things that are absolute musts. What traditions, trips, tasks, and activities are non-negotiable for you? Now I want you to cross out the things that you wouldn't really be disappointed about if they didn't get included. Maybe that includes an extra trip to the cabin or a road trip or going to the museum or starting a new work project or taking on more clients. Remember you can't do it all, so what are you willing to let go of or put off for another season? If you're anything like me, most of the things on your list will fall in the middle somewhere. Do you know what that indicates? They're optional. They're not non-negotiable, but they're not just fluff, either. Doing this exercise myself, I was amazed to see how many things I wasn't willing to claim as non-negotiables. Yes, I'd love to do them this summer, and I might be mildly disappointed if I don't get around to them, but they aren't essential. The key to simplifying your summer goals is to focus on the essentials, just the things you highlighted. Those are the big-ticket items, the ones that have to take priority. The rest is just icing on the cake. This summer, I'm giving you permission (and maybe a gentle push) to just focus on the essentials. If you make time for those, the rest really won't matter! So what are your biggest (highlighted) goals for the summer? Now that you have your goals figured out for the summer, you need to prioritize them. I did a Facebook Live video recently about priorities, and I'm not going to stop anytime soon. They're so important! And many of us are doing them wrong. I hate to break it to you, but you can't have twelve priorities. You probably can't even have seven. I'd suggest keeping your list to five or fewer because it's much more manageable and you're much more likely to follow through that way without spreading yourself too thin. Based on your goals, what do your priorities need to be? Normally, I would suggest identifying your priorities first, but hang with me here if you're thinking this doesn't make sense. In this instance, I started with goals because many of us think first in terms of what we want to accomplish this summer, not necessarily what we want to focus on and prioritize. So I ordered these items based on our natural thinking patterns. Our priorities do inform our goals, but we can reverse-engineer them based on the goals we've declared. So using my own example, because attending my dad's softball games on Monday nights is important, that indicates that family is important to me. Because I want to grow vegetables in my garden and go for daily walks, I know that I'm valuing and prioritizing my health. Because I highlighted community, I know I need to prioritize time with my people and investing in relationships. And because I decided Sabbath is a non-negotiable, I need to prioritize rest and worship, too. You see how that works? What priorities do you need to have in place in order to accomplish your biggest goals for the summer (the ones you highlighted in step 1)? Summer schedules can be the very definition of crazy if we're not careful with them! Before we know it, they get filled with graduation open houses, barbecues, bonfires, work deadlines, new projects, health goals, road trips, cabin weekends, weddings, bridal and baby showers, and all kinds of appointments. Those are all good and necessary things, but they can be overwhelming when they're packed in too tightly. This summer I'm advocating for a simpler schedule. We don't have to do all the things. In fact, let's not do all the things. That just sounds tiring! Let's do just the best, the most important things. The first step is to put in the things you're prioritizing, actually in their appropriate time blocks on your calendar. If you declare portions of your time to be used for certain things, you're much more likely to keep those "appointments" and invest in what matters most to you. If you just say you'll "do that when you have more time" or "do that sometime," you probably won't actually do it. Put the non-negotiables into your schedule first to make sure you create space for them. Then you can start filling in the middle-of-the-road things (the ones that weren't crossed out or highlighted) as they fit. It's a matter of choosing to invest in the best things, which means sometimes saying no to other good things. It can be hard, but it's oh, so rewarding when you have ample time to spend doing your favorite things with your favorite people because you chose to be intentional with how you spend your time. You can write it on a paper planner, a dry-erase calendar, or put it in your phone (I actually do all three because I'm a planning nerd like that)-- whatever works best for you. Color-code it by category or person, or don't. Make it fancy, or don't. Just write down how you plan to use your time, simplified down to the most important things. I love trying new recipes all the time and cooking with obscure ingredients because I truly enjoy cooking, and there are always new things to try! But I'm falling in love with a simpler approach-- using a few really good ingredients to make something simpler, fresher, and lighter. Summer's the time for lighter, fresher foods, right? I don't mean just salads, but certain dishes are more summery than others, and this is the opportunity to take advantage of all the amazing foods summer has to offer, along with simpler ways of preparing them. Doing so gives us the opportunity to spend less time surrounding a hot stove and more time relaxing by the lake or playing games with our people, and I'm all for that! Meal planning is a great way to simplify your approach to cooking. It's so stressful to not know what you're going to have for dinner until 4:00pm when you get home from work and take inventory of an almost-empty fridge and pantry. The better way? Planning your meals in advance. Not only will it save you from last-minute decisions and unhealthy choices they breed, but you'll be able to craft your grocery list from your meal plan so you have everything you need on hand already! And you can pick a few and rotate through them to simplify the process even more! I love hosting get-togethers and parties, but it can be really stressful to prepare for having people over. Unless you choose to simplify the process, that is. We often feel pressured to create Pinterest-worthy parties and have spotless homes. But when was the last time you really cared if your friends dusted before you came over or had their food revolve around a unified theme for the evening? There's about a 95% chance you said "never" to that question. And if you don't care about others doing that for you, others won't care if you do that for them. When people come over to your house, whether it's just for coffee or a playdate or a dinner party or a birthday, what they really want is time spent with you and the other guests. They don't need fancy food, beautiful decor, or an elaborately-planned set of games and activities. Those things have their place, but that place is not simple summer hospitality. So my advice for this summer is this: focus on the people and creating a welcoming place. Make some good, simple food (see step 4), turn on a playlist, and hang out with your people. It's that simple! Okay, but what about cleaning before you host things? Or just cleaning in general? I wish I could say you could just forget about it, but your house would get pretty gross by September. You do need to clean your house some, but you don't have to deep clean on a regular basis. Dust. Sweep. Vacuum. Make sure your kitchen and bathroom are presentable (not perfect, just passable; we can lower our standards here a little in the name of authenticity and simplicity, friends). Maybe do a quick tidy-up for five minutes before the doorbell's due to ring, just to pick up tripping hazards and hide the dirty laundry. Or maybe don't. You make that call. I wrote all about spring cleaning, and I even did a post on how to keep your home clean, which is what I'm talking about here. It's maintenance. It's just keeping things from getting out of control. If it's clean enough for you and the other people who live there, it's clean enough. You do not have to go to every party, get-together, coffee date, graduation open house, and bonfire you're invited to. You now officially have my permission to say "no." I know what it's like to feel bad for wanting to say "no" to some social situations so you can do other things like rest, sleep, spend time with your family, or just have a little space for yourself. There's no shame in saying "no," especially when you're doing it intentionally. If you find yourself feeling worn out, start saying "no." If you start feeling obligated to attend absolutely everything, start saying "no" to create some margin. If you're dreading going to a particular happy hour or graduation party, just say "sorry, I won't be able to make it." Make spending time with your core people your main priority in social situations. Give priority to the events and groups that mean the most to you, the ones you most want to invest in. And if you have the schedule space and emotional space, work in some of the other things around the edges. But don't feel like you have to go to your second cousin's neighbor's graduation party just because they invited you on Facebook. And when you're going to get-togethers and parties or hosting them yourself, keep it simple. Good food, good people, good music. That's all you need! It doesn't have to be elaborate or fancy. We're not trying to impress; we're trying to connect and enjoy life. I love trips with my people, whether we're talking about road trips, cabin trips, or trips that require getting on a plane. I love spending time with my people in concentrated amounts, and trips certainly do that! But planning trips can be complicated and headache-inducing. We think we have to fill our time together will all the activities and plan for every contingency. What if we just streamlined and simplified things a bit? What if we came up with a handful of activities but didn't actually fill our entire schedule? Some of my favorite trips have been that way. We've brainstormed activity ideas so we can know what to pack if necessary, but we wait until we're settled in our vacation place to decide what we want to do that day. Then we're not pressured to follow a schedule we set at home (before the fatigue of travel set in and the weather inevitably changed), and we have the freedom to go with how we're feeling that day, relaxing on the beach instead of touring some historical site or sleeping in instead of getting up early. My parents build in a buffer day at the end of family trips, which I think is pure genius. They know how much travel takes out of them, so they plan a rest day for after we get back. And do you know what happens? They're less stressed and rushed getting back because they know they built in that margin already. They have plenty of time. I want to learn from them in that practice. And I encourage you to do the same-- whether it looks like a buffer day to rest after your trip or just a looser itinerary that allows for more rest stops and play when you're traveling, it would be far less stressful and far more enjoyable! Social media can do great things in terms of keeping us connected with our loved ones, reconnecting us with people from our childhoods, and forging new connections with people who were previously strangers to us. But it can also feed our FOMO feeling, and that's not good for our simplified summer goal or our sanity. We want to enjoy our summers, not spend them comparing our trips and lake days with others (or worse, our afternoons at the computer finishing a project with someone's day at Myrtle Beach). I'm choosing to simplify my social media this summer. But what does that mean in practical terms? I have a few guidelines for myself. Feel free to adopt and adapt them for yourself! Summer is a great time to be outside! Unfortunately, many of us work indoors (like me! ), so time spent outside is limited, which makes it all that more special! I'm an advocate for doing whatever kind of fitness you like the most. I'm aware that different people like doing different things. That being said, summer gives us an open door to some activities we can't necessarily enjoy all year long (hello, Minnesota weather). So I encourage you to branch out this summer and take advantage of the things summer has to offer. Fitness doesn't have to be complicated. All it takes is getting your body moving. And it doesn't have to be the same thing all the time, so this is the perfect time to mix it up a little and try something new when the opportunity arises! Does anyone else feel like they always manage to forget something when they go to the store, so they inevitably have to go back the next day to get it (and, of course, five other things that weren't even on the list)? Not to mention all the fancy, shiny summer things that we want to get-- new swimsuits, sunglasses, shorts, sandals, drink dispensers, dishes, serving platters, table cloths, gift bags, and lawn decor, just to name a few. I'm here to give us all an out: we don't need all that stuff. I realize sometimes we do need to replace old things or get some supplies for a get-together, but generally speaking, we can make do with what we have already! It might take getting a little creative or being willing to borrow from a friend or a family member, but we don't need to buy more and more stuff, especially if it's just the same as something we already have, but a little newer or with a summery print added onto it. We have the freedom to decide we don't have to go shopping for all that extra stuff we don't need. And for the things we do need, like food, we can simplify our shopping process still. We can use lists and plan our trips in a more efficient way. If we work to reduce the number of stops we make, we'll save time and energy. If we stick to a list, we'll save time and money. If we get into a habit of creating a list while we're at home, we won't forget about things we're running out of, and we'll be able to base the list off our simplified meal plan (see step 4), so we won't waste the food we buy. Bonus points if we can stick to one store for everything! That's not my life, but I do batch my errands, strategically going to the farthest store and hitting the others on the way back in a methodical way that saves me time (because I'm not running out on separate trips) and getting everything I need! If you know me at all, you probably expected this one to make the list. But physical clutter breeds mental clutter, and the last thing we need is more mental clutter getting in the way of us savoring our summers! When we take the time to clear out the excess, we'll be surrounded with things that bring us joy. We'll be able to enjoy other benefits, too! If you're looking for more tips and a step-by-step guide to decluttering, I wrote more about it in the series that starts with this post, and I ran a Decluttering Bootcamp you can check out, too! That's it! I don't know how you feel after reading those, but I feel like my summer has already gotten simpler! I hope you find those tips helpful, and if you did, I'd love to hear from you (or see you share it on your favorite social media platform) and how you're going to live slower this summer! And if you'd like some help to live slower and more intentionally, I'd LOVE to chat with you about that! It's my passion and joy to help women create lives and businesses they love by designing them with joy, simplicity, and intention, so let's chat about living more slowly!